Right to left: Bewket Siraw Adgeh (Ethiopia Ministry of Agriculture) and Gebregziabher Gebreyohannes, Ethiopia livestock state minister (photo credit: EIAR / Semunigus Yemane). A new project that will test and make available high-producing chicken breeds to thousands of smallholder farmers has now been rolled out in sub-Saharan Africa. The Africa Chicken Genetic Gains (ACGG) project was officially launched in Ethiopia by Gebregziabher Gebreyohannes, the country’s state minister for livestock, on 5 August 2015 at the Ethiopian Institute for Agricultural Research (EIAR). The Ethiopia launch of the project follows similar events in Tanzania and Nigeria [LINK], the other two focus countries of the initiative. The program will improve chicken genetics and the delivery of adapted chickens to support poverty reduction, productivity growth, increased household animal protein intake, and the empowerment of women farmers in Africa’s rural communities. Tadelle Dessie, a researcher at ILRI, and the ACGG project leader, explained how the project will work in the three focus countries. 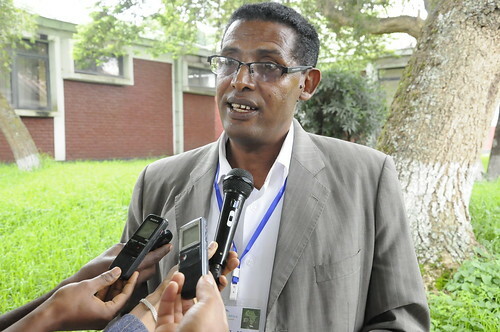 Solomon Abegaz, co-principal investigator working for EIAR, then explained the set up of the project in Ethiopia, which will be implemented in Amhara, Oromia, the Southern Nations, Nationalities, and Peoples’ Region, Tigray and Addis Ababa. He said the results of the selection criteria, the rationale and methodology behind the baseline survey would be collected via the Open Data Kit. 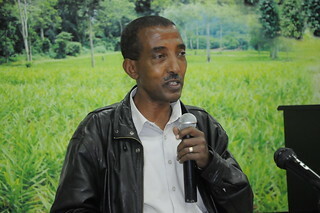 Solomon Abegaz (EIAR), co-principal investigator of ACGG in Ethiopia (photo credit: EIAR/Semunigus Yemane). He further revealed details about the project’s on-farm and on-station testing and described the tropically adapted chicken strains that have been selected for testing. Finally, he explained the program’s stakeholder engagement approach that will use national-level and village- level innovation platforms. The event also discussed outcomes of the first innovation platform meeting and concerns from partners. 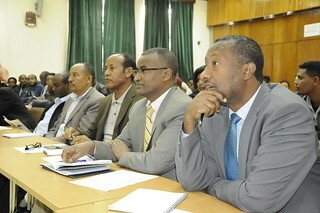 Participants said project interventions should focus on sharing resources with key partners in Ethiopia, aligning project plans with national priorities, maintaining the neutrality of the international advisory committee and the capacity of this project to contribute to longer-term food security (considering the rapid population growth) in Ethiopia. They also requested that a national advisory committee be set up, in addition to the scientific and industrial advisory committee, and that the program uses effective approaches in reaching youths and women. Tadelle Dessie interviewed by the media (photo credit: EIAR / Semunigus Yemane). The launch concluded with a ‘marketplace’ exhibition by commercial poultry actors who showcased their products and services. The event was attended by more than 60 representatives from the project lead agency, the International Livestock Research Institute (ILRI), the in-country implementing agency (EIAR), the Ethiopian Ministry of Agriculture and partner organizations. This launch was preceded by a project innovation platform (IP) meeting, facilitated by the PICO-Eastern Africa team, on 3-4 August 2015 at EIAR. At the IP meeting, participants said the new project needs to address. Availability of input supplies – including credit, vaccine doses and feeds. Marketing challenges – specifically how to preserve poultry products during fasting periods in Ethiopia, as well as finding markets in urban areas and minimizing the dominance of brokers in the value chain. Policy challenges – how to minimize taxation on vitamin and mineral premix importation and how to guarantee standards and quality control for all inputs. Disease challenges – how to avail veterinary services for smallholder chicken producers and how to assure biosecurity. Training challenges – how to develop tailor-made training and related manuals for farmers and other actors in the value chain. With the final launch event of ACGG (in Ethiopia) now completed, the project is now officially rolled out in all the focus countries and project work is expected to accelerate. 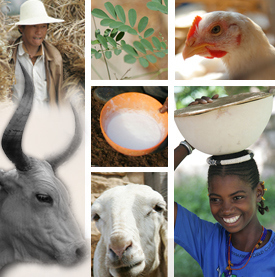 As one of the ACGG Ethiopia launch event participants mentioned, livestock is crucial in the second growth and transformation plan of Ethiopia. Expectations are thus raised high to see the project get off to a flying start. Tags: EIAR, launch. Bookmark the permalink.